Imagine sitting in a hot pool with a cold beverage in your hand. The Clark Fork River rushes by just yards downhill from the pool. Rocky cliffs rise up, covered in bright green lichens, mosses, and bryophytes, while snow drifts down from the sky. 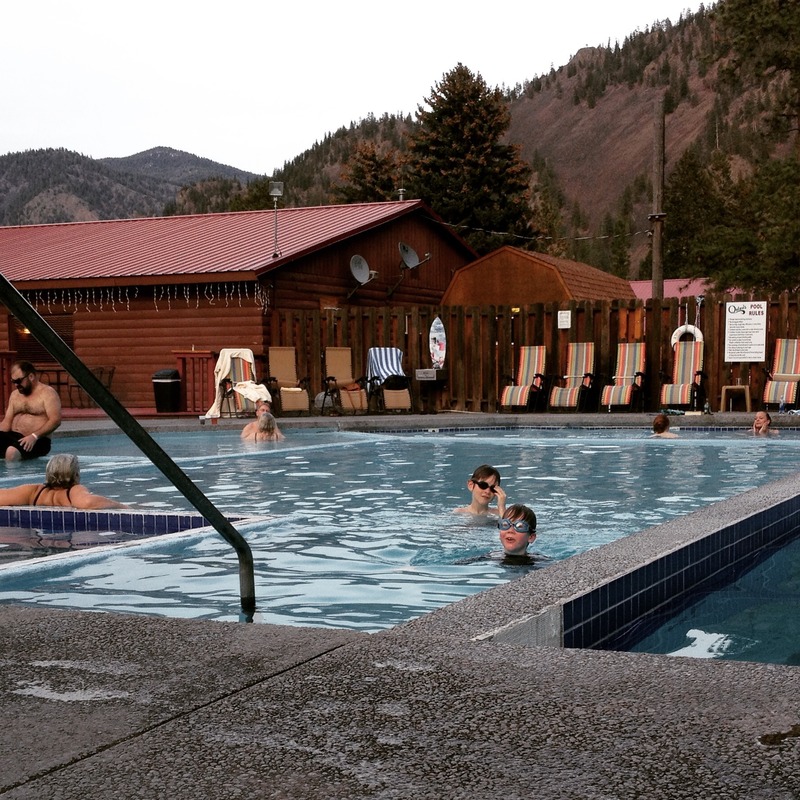 Quinn’s Hot Springs is perched in a canyon between St. Regis and Highway 200 near Paradise. A little out of the way, but well worth the drive. Train tracks line one side of the river, and the highway the other, but the resort is relatively quiet and serene. Five hot pools, each a few degrees warmer than the one next to it, and one river-water-cold pool, ensure perfect soaking temperatures for everyone. The soaking pools range in temperature from 60 to 106 degrees Fahrenheit. The two swimming pools are between 80 and 95 degrees. The staff said the pools are monitored for cleanliness and temperature every three hours and emptied and cleaned every other day. Chemical-free, mineral water, with its combination of silica, sulfate, calcium, magnesium, sodium, potassium and iron, is purported to have excellent health benefits. Whether or not that’s true, it feels great to soak in them and watch clouds float by. Jerry Bendick from Spokane was soaking in one of the pools with his wife, Cheryl. They were taking advantage of Quinn’s Winter Romance Package. “We are loving every moment of it. 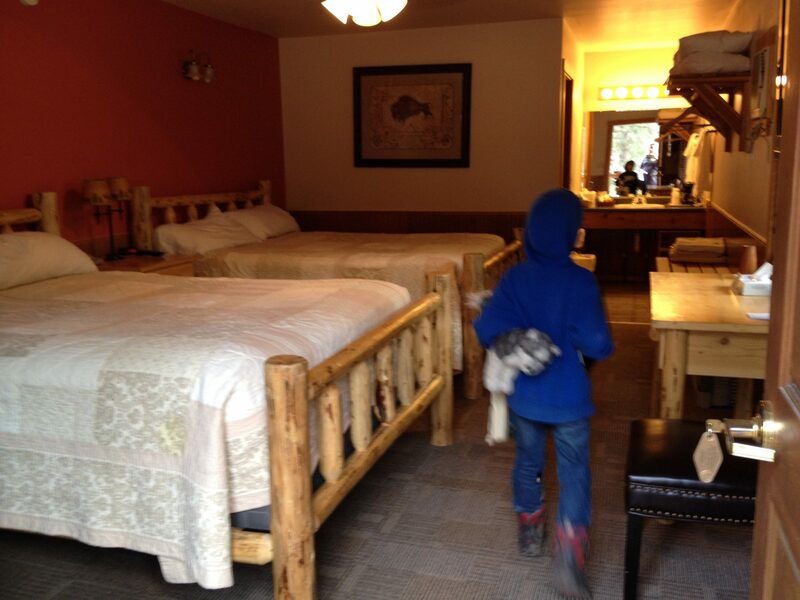 It’s so quaint and comfortable and the staff are very accommodating,” he said. The Bendicks were having such a good time they decided to come back in a week with friends. The Harwood House restaurant is reputed to be among the best and serves breakfast, lunch and dinner, seven days a week. The extensive menu includes, slow-roasted prime rib, aged center-cut steaks, lobster tail, crab legs and French-style duck breast. Reservations are strongly encouraged. A simpler dinner menu, along with traditional bar food including mozzarella sticks and chicken wings, is offered in Quinn’s Tavern. The tavern has a nice selection of beers (best sampled poolside), wines and liquor, in addition to gaming. A reception and conference room hosts weddings, receptions, family reunions and business conferences. As for lodging, there are a lot of choice, from adult-only rooms in the Glacier Lodge, to family-friendly duplexes in the Canyon Cabins, to the luxury River View Cabins complete with spectacular views of the river and mountains, whirpool baths, and cast iron stoves. Some rooms have mini-refrigerators and microwaves, while the nicer cabins have kitchenettes. The group all schedule massages throughout the weekend. In between plunges in the pools, there is Blue Ribbon fishing to be had on the Clark Fork River, right outside the resort. Or for the more ambitious, guides will get you out on the river for a full day. Other day trips include horseback riding, a visit to the National Bison Rage or Flathead Lake. Lookout Pass ski area is nearby. 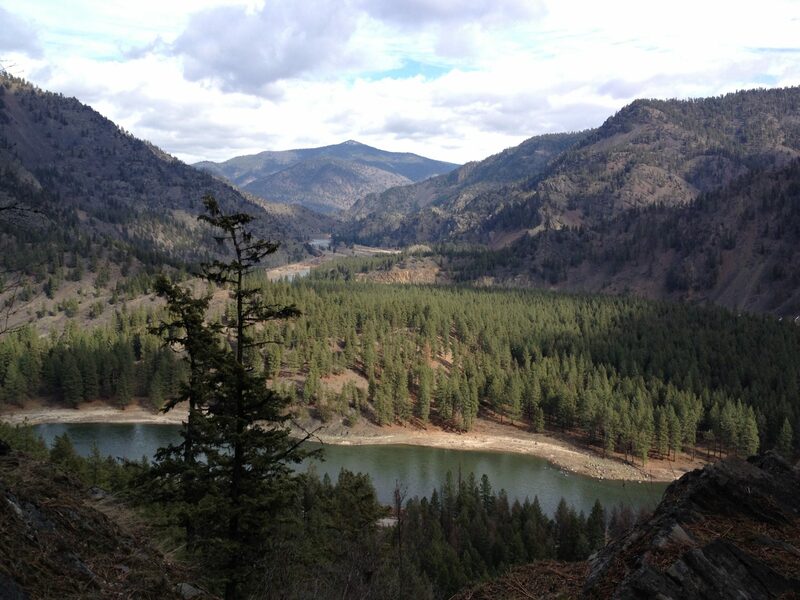 Two miles south of Quinn’s, a trail leads from the Cascade Campground up Iron Mountain. Whether hiking or cross-country skiing, it’s a mellow mile and a half to the top of Cascade Falls. And when you get back down, the pools are waiting. You got me with the soaking pools. They sound heavenly. With the food and beer, I may never want to leave. That looks amazing! My daughter would love that pool. I think if I went here, I’d sit in the hottest pool all day! I love the beer recommendation 😉 Your kids look like theyre going to trip on their towels in that first photo! 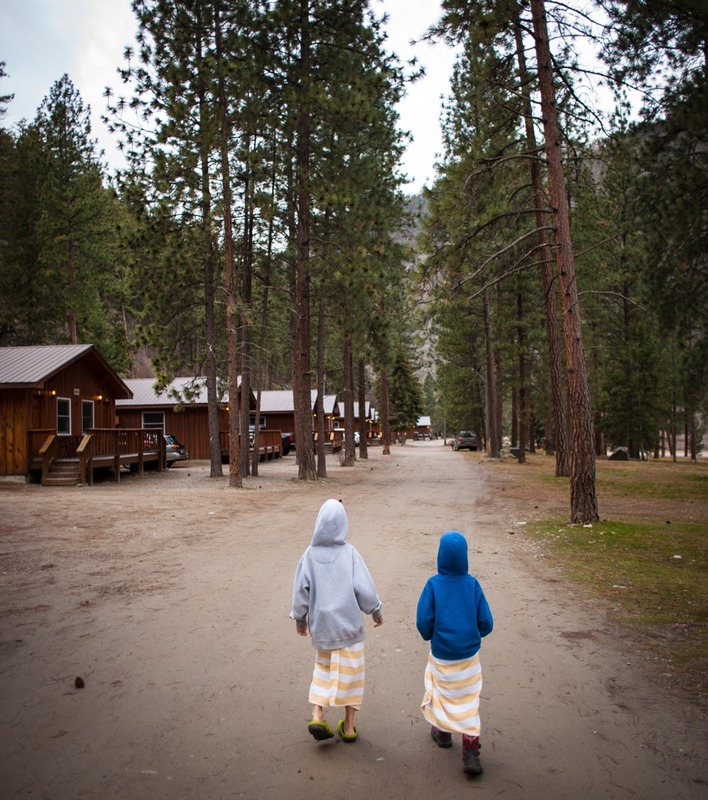 Swim suits and snow boots — that’s how we roll in Montana!